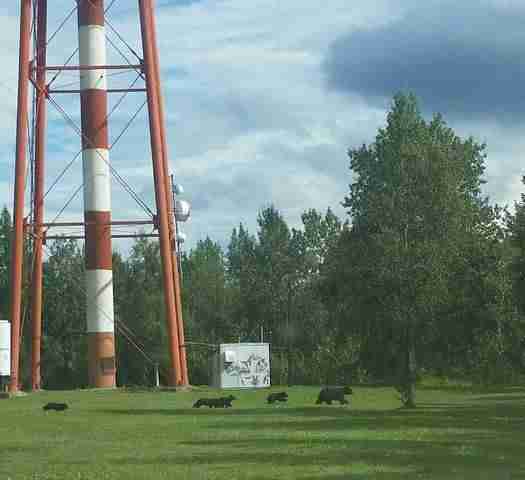 UPDATE: Fish and Game has decided to relocate the bears following public outcry and a call from Alaska Gov. Bill Walker. A young black bear family is about to be killed because people wouldn't leave them alone. The mother black bear, who's been known to locals for three years now, and her four 1-year-old cubs woke up early from hibernation this year. The plants they usually eat hadn't grown in yet, so they ventured into Government Hill, a small neighborhood in Anchorage, Alaska, in search of food. Since the locals weren't yet expecting them, there was plenty of unattended trash. 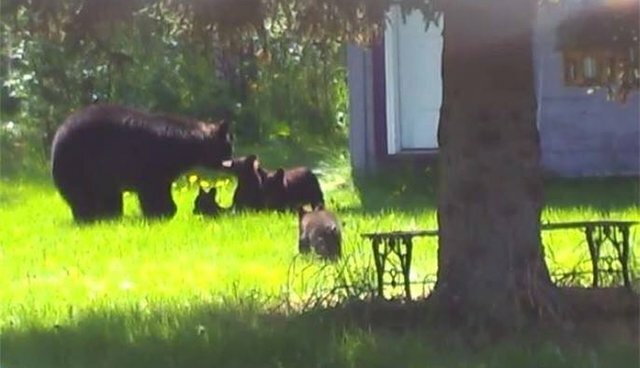 "If you're a bear and you're a mom and you have four cubs and you just woke up, you're hungry," Stephanie Kesler, president of Government Hill's community council, told The Dodo. "There was nothing for them to eat ...[so] they were strongly attracted to trash." The hungry bears had a few incidents with locals, including one case last week where they tried to get into someone's home for food and broke down the door. But since the neighborhood borders a swath of untouched forest, locals are accustomed to wild visitors and figured they could make it through the summer. "A mother bear with four (!) 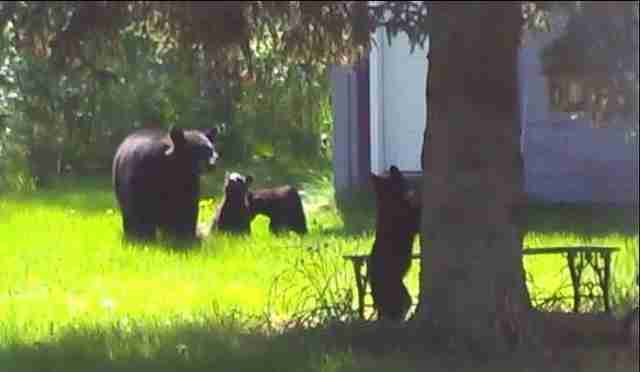 cubs has taken up residence on the west end of Government Hill," the council posted on the neighborhood Facebook page in 2014. 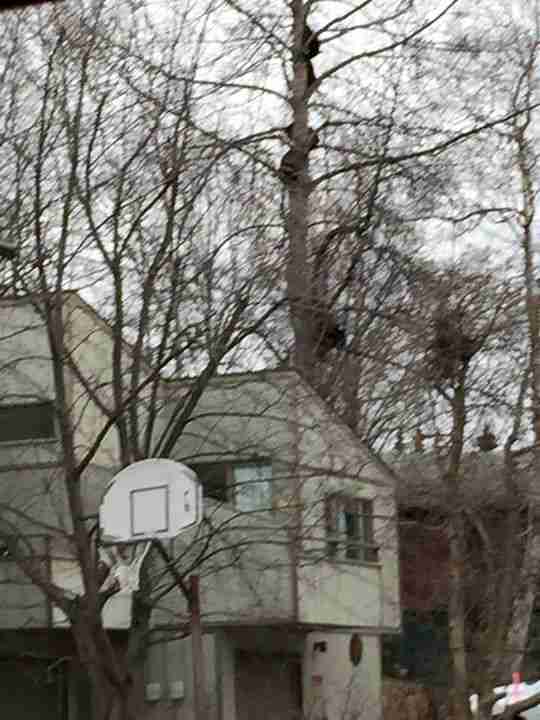 "This is our second year in a row with a resident bear. We all successfully co-existed last year and now is a good time to review the best practices below that will help all of us - both bears and humans - make it through this summer safely." "The cubs are very cute, but are not to be approached or messed with in any way," the post reads. "Give the bears a WIDE berth." The hopes for a peaceful coexistence were dashed on Wednesday. 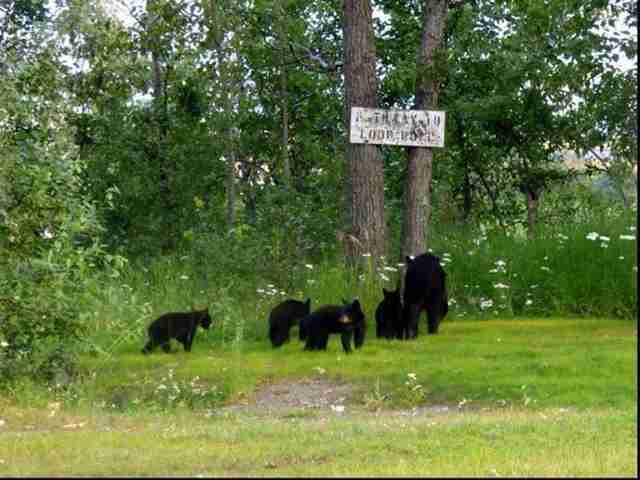 When the media and the public heard about the bear family, they swarmed the town for pictures. "We had news crews coming in, we had professional wildlife photographers coming in, we had gawkers coming in and they were all crowding her," Kesler said. The group surrounded the bears, forcing them up into a tree. As any parent would, the mother became protective of her little cubs and began huffing at the crowd - a characteristic sound that bears use when they feel threatened. A biologist from the Alaska Department of Fish and Game witnessed the incident. The next night, Fish and Game announced that it would euthanize the family in the interest of public safety. Ken Marsh, public information officer for Fish and Game's Division of Wildlife Conservation, said that the bears' habit of eating trash contributed to the problem, but so did the people who continually test the patience of local wildlife. "The bear's been growing bolder and so have the people," he said, noting that some people seem to think of bears more as pets than as wild animals. "You've got people getting too close and pushing those boundaries." The crowd around the bears got so big on Wednesday that it actually blocked off the street and prevented a school bus from getting through, Marsh said. He emphasized that Fish and Game wasn't happy about killing the bears. 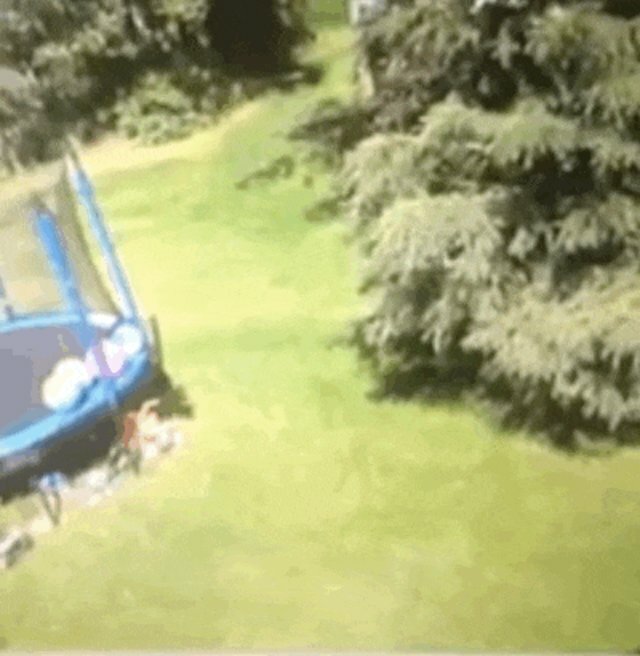 "It's an unfortunate situation," he said. Kesler said she understands Fish and Game's decision, and the need to keep the public safe. But she's adamant that were it not for the foolishness of the people who cornered the mother bear, it might never have come to this. "If things hadn't turned into a circus on Wednesday, maybe we would have been able to make it through," she said. "But that just put so much stress on her ... I am just so angry about what happened on Wednesday." 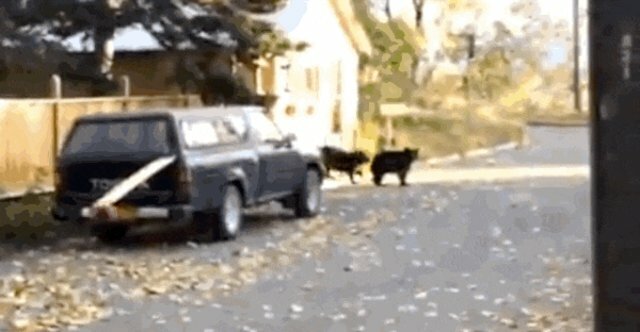 She added that people would continue to act unreasonably as long as the bears are around, pushing the situation until there's a breaking point. "[The public's behavior] basically signed the death warrant," she said. It's no secret that human interaction generally means bad news for wildlife. But Kesler said it's particularly a problem when people from urban areas or the "lower 48 states" show up and think it's acceptable to run up to wildlife and take pictures. "People show amazingly bad judgment," she said. "It's the same with moose. You get tourists walking up to moose and you're like, 'Oh my god, a moose will kill you!'" Thanks in part to that stupidity, Fish and Game is getting ready to kill the bears. Officials are currently monitoring the mother and her cubs, waiting for the next time they're all together and can be safely - for the humans - euthanized. "People need to clean up their acts," Marsh said. "If there's no food available for the bears there's no reason for them to hang around and we don't have to have this vicious cycle repeating itself." 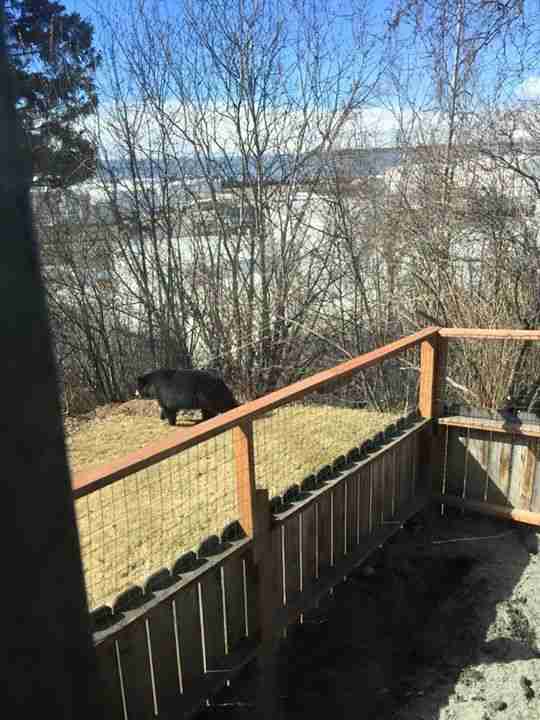 Kesler said that residents have been asking for bear-proof trash cans since the bears first appeared last year, in order to prevent this situation, but they haven't received them. Marsh said that the only way to save the bears would be to move them to a sanctuary, but the department has been unable to find one that will take them. "We do consider those type of opportunities," he said. "This time there are no wildlife facilities or zoos that are able or willing to take yearling cubs or adult sows." 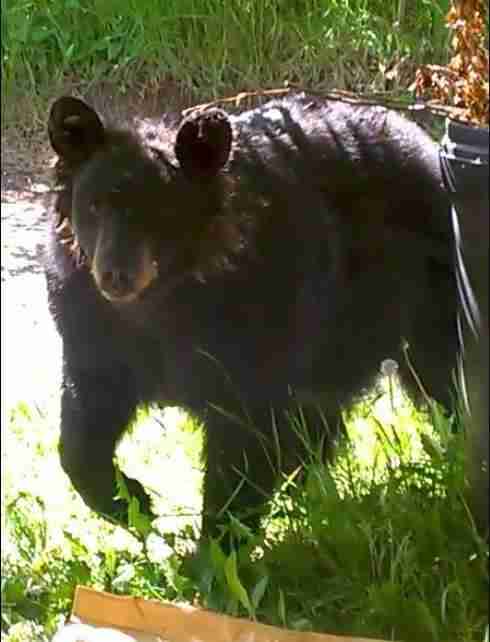 But despite Fish and Game's concerns, black bears, particularly mothers, are rarely aggressive. In the past century, only around 60 people have been killed by U.S. black bears, and angry displays rarely lead to physical contact unless the human involved is being reckless. 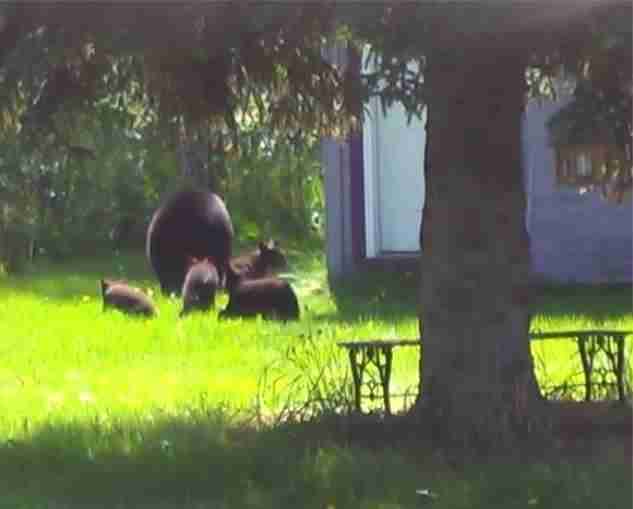 "They make noise, they swat the ground with their paws and they run at people," noted bear behaviorist Stephen Herrero told The New York Times in 2011 about black bear mothers. "They want to make you think that they'll eat you alive, but they almost always stop." And of those fatal attacks, every last one was carried out by a lone bear, not a family. Ninety-two percent of killer bears were male, not female. 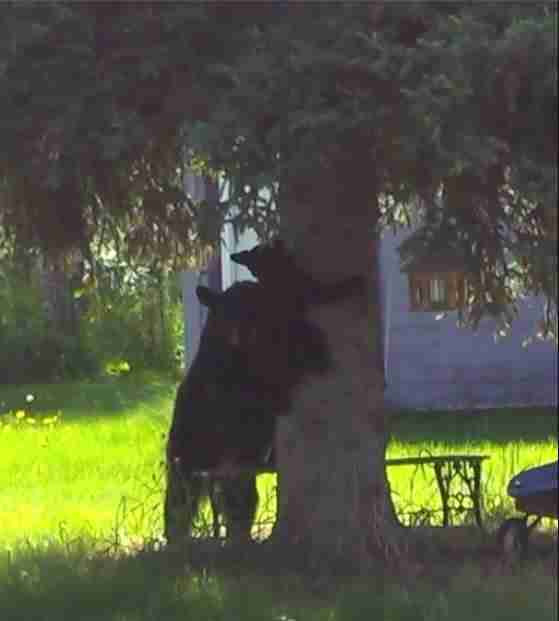 And in 88 percent of cases, the bear was stalking the human for food - not just startled at the garbage can. And while this family's fate was sealed because the mother bear huffed at onlookers, Herrero and other experts say that bears who make noises aren't the ones you need to worry about; noisy bears are just scared bears, not killer ones. But Fish and Game's decision is made, and Kesler keeps coming back to the "what ifs." "We might have had a shot at getting them through," she said. "If human behavior hadn't sealed the deal." There's a petition asking Fish and Game to reconsider that you can sign here.